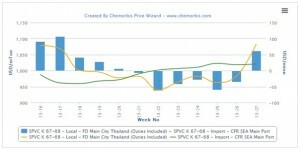 Players in Thailand report that the country’s local markets for homo-PP and PVC have increased their premium over import prices following a period in which prices had traded close to par while local PVC had actually traded at a discount relative to import materials as per the pricing service of ChemOrbis. From late April until the end of May, local PP prices in Thailand carried a significant albeit steadily declining premium of around $30-70/ton over import cargoes. For the month of June, Thai homo-PP held a small premium of around $10-20/ton over imports, with import cargoes even briefly gaining a premium over local cargoes towards the start of the month. However, strong increases from local sellers pushed the premium for local cargoes over imports back above $50/ton during the past week. 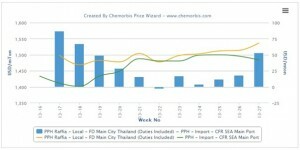 In the PVC market, local cargoes in Thailand regained their premium over imports after trading at a discount throughout the month of June. In late April, local PVC had been trading with a $90-110/ton premium over imports, but this premium faded rapidly over the course of May and by the start of June, import prices had gained a premium of around $30-60/ton over local prices. At the start of July, local prices regained a $60/ton premium over imports as local increases were announced well above the increases seen in the import market. 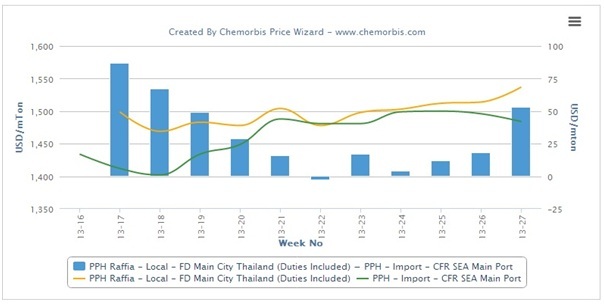 According to ChemOrbis, distributors and converters reported seeing THB3000/ton ($96/ton) hikes on local PVC prices at the start of July. “Producers raised their prices owing to limited supply and the depreciation of the Thai baht against the US dollar. We are not very optimistic about the demand outlook for the next few weeks as we think that buyers will offer resistance to higher prices,” a distributor reported.